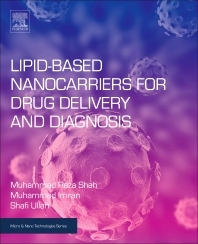 Lipid-Based Nanocarriers for Drug Delivery and Diagnosis explores the present state of widely used lipid-based nanoparticulate delivery systems, such as solid lipid nanoparticles (SLN), nanostructured lipid carriers (NLC), nanoliposomes, micelles, nanoemulsions, nanosuspensions and lipid nanotubes. The various types of lipids that can be exploited for drug delivery and their chemical composition and physicochemical characteristics are reviewed in detail, along with their characterization aspects and effects of their dimensions on drug delivery systems behavior in-vitro and in-vivo. The book covers the effective utilization of these lipids based systems for controlled and targeted delivery of potential drugs/genes for enhanced clinical efficacy.